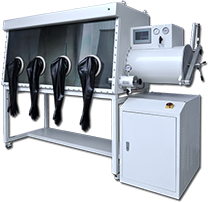 Glove box with purification system is a kind of laboratory device which can be filled with a high purity inert gas into the box and active substances can be filtered out of the box circularly. 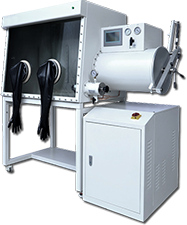 It is also called “vacuum glove box with water and oxygen removal”, and “inert gas purification glove box”. Main functions of this kind of glove box: water content removal, oxygen content removal, other organic gas removal. It is widely used for making high pure environment without water, oxygen and dust content. TThe box and purfication system are connected together and they both form a well-sealed working environment. When inert gas or nitrogen is filled into the box continuously, the active substances inside the box shall be removed circularly out of the box to keep the inner box in a high cleanness and a high purity inert gas environment (water content≤1 ppm, oxygen content ≤1 ppm) all the time. 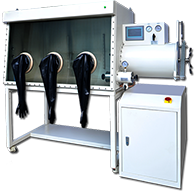 Glove box with purification system is mainly composed of two parts: a main box body and a transition chamber. We can also design and manufacture customized specifications according to the special requests of the clients. 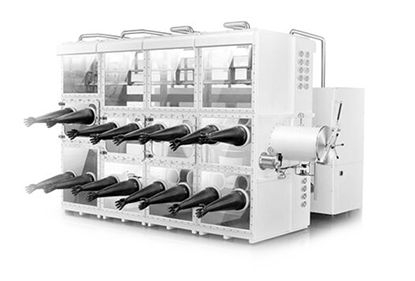 The main box body has two (two or more) glove operation interfaces in front or back side of the box, which enables one or more people to operate the glove box at the same time, and improves much more efficiency of the glove box utilization. In addition, there are observation windows on the front or back side of the box where people can observe the operation process clearly inside the box. There are air suction and charging nozzles which can be used for air sucking or charging on the valves of the transition cabinet. The main box body is also installed with valve and nozzle, which can be used to maintain air pressure balanced inside the box body if necessary. The transition cabinet is a transition space between main box body and outside, which is composed of two sealing doors, two valves and a chamber body. Both of the sealing doors can be used effectively to isolate the inner box of the main body from outside of box body. That enables people to send things in or out of the box freely under conditions that the box body is isolated from air atmosphere, avoiding many troubles of repeating evacuation and inflation. Applies to making pure environment with removal of water, oxygen and dust. R&D and production of battery industry (Lithium ion battery, powder battery, solar cell, lithium ion phosphate battery ). R&D and manufacture of special lamp (HD lamp, metal halide lamp, ceramic metal halide lamp). Automatic control Controlled and monitored automatically by the program control unit. Box body manual/auto gas replacement Before initial use, cabinet air shall be "replaced" with inert gas or nitrogen, which can be easily achieved by using auto gas replacement function of the cabinet provided by the system, gas replacement can also be achieved manually. Transition cabinet manual/auto replacement When material was placed in a box, the transition cabinet of the gas needs to be replaced. You may automatic gas exchange function provided by the airlock system; you may also achieve gas replacement manually. Gas purification control After setting up the work status and results, the system purification procedures set to “Auto”, the system will automatically maintain the atmosphere condition of the cabinets, then the system will automatically complete the work; you may also choose to manual control. Pedal air-pressure control Use the foot controller-through inflation or exhaust system, to control gas pressure in the cabinets. Reduction of purification system Purification materials restore is done automatically by the system, we only need to set the conditions of system restore. Open “restore”, the system will automatically complete the restoration work, the whole process does not need to monitor. On-line operating condition detection The control system provides users with the operating condition detection function of the component of the equipment. Such function can be used to observe operating condition of the component and inspect fault source of each function and component. System parameter setting System settings function, users can set the system parameters to achieve the desired working conditions and feature set. Data logging function The system provides operating parameter record of the equipment, this record can be traced back to monitor production or experiment. Control of gas reserve function When the temporary cutting of control-gas supply, or cutting off control-gas source for some time, the control-gas reserve will protect the equipment continue working. Standby function of cycle gas cooled Purification system provides a heat exchange for cooling the circulating gas, can be used alone by injecting the coolant to control the temperature of the circulating gas. Multi-level safety system The control system sets up a variety of security features, include multilevel security tips, alarm and disable function, to protect the safety of operating personnel and equipment. Protection function when purification cycle blocked When the circulation system is blocked, the control system prompts alerts, and take the initiative to adjust the speed of air, in order to protect the motor, though this function can also check out system cycle blocked, pipeline poor, filter control dust obstruction, and other issues.